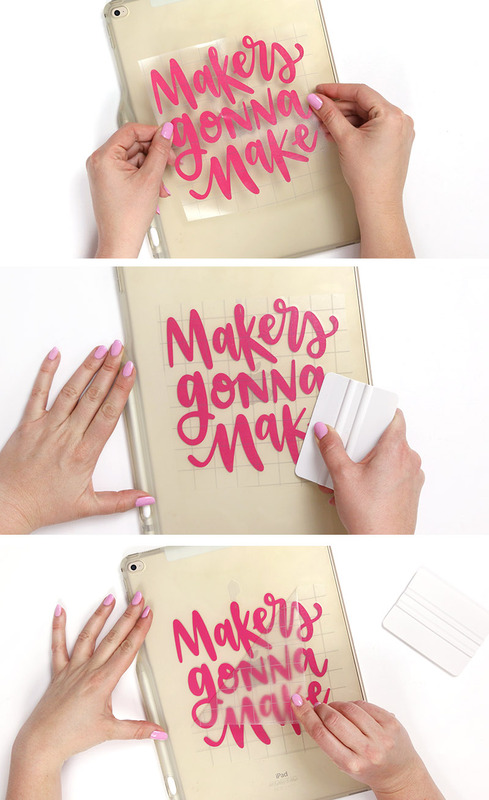 Learn how to make DIY vinyl decals and decorate all the things with custom designs! If you are new to working with vinyl, it can be a bit overwhelming, but this step-by-step guide will teach you exactly how to use adhesive vinyl, and you will be making wall decals, signs, mugs, and more in no time! This post contains affiliate links, which help to support this site at no extra cost to you. Guys – I am a big fan of crafting with vinyl and my Silhouette. I mean, I even made an entire online course all about crafting with vinyl and your Silhouette. I am a total vinyl crafting nerd, and I want to share my vinyl nerd love with you all. 🙂 If you have never worked with vinyl before, I hope you will give it a try because I think you will love it. 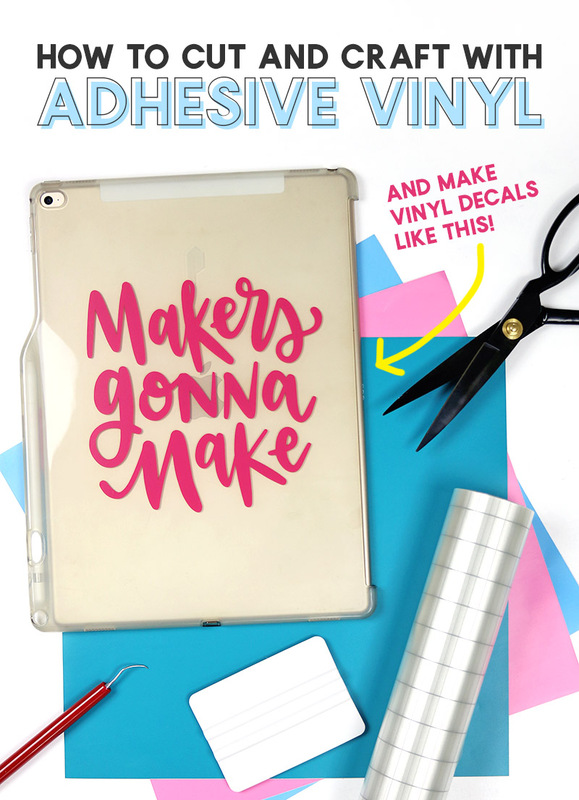 This post will get you started on your vinyl crafting journey and teach you everything you need to know about using adhesive craft vinyl with your Silhouette or Cricut. Ready to make some DIY vinyl decals? Let’s do this! There are a few basic steps in working with adhesive vinyl, and we will go through each one. They are preparing your cut file, cutting, weeding, and applying. That’s it! 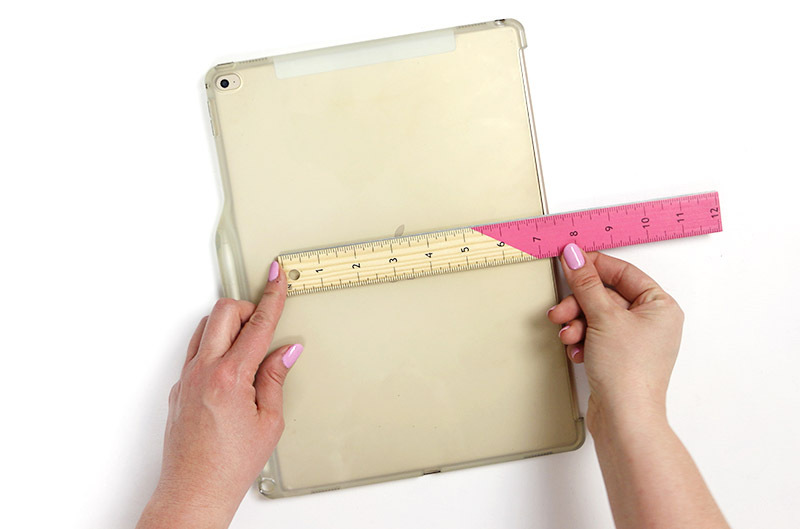 For demonstration purposes, I will be making a DIY vinyl decal to add to my ipad case. 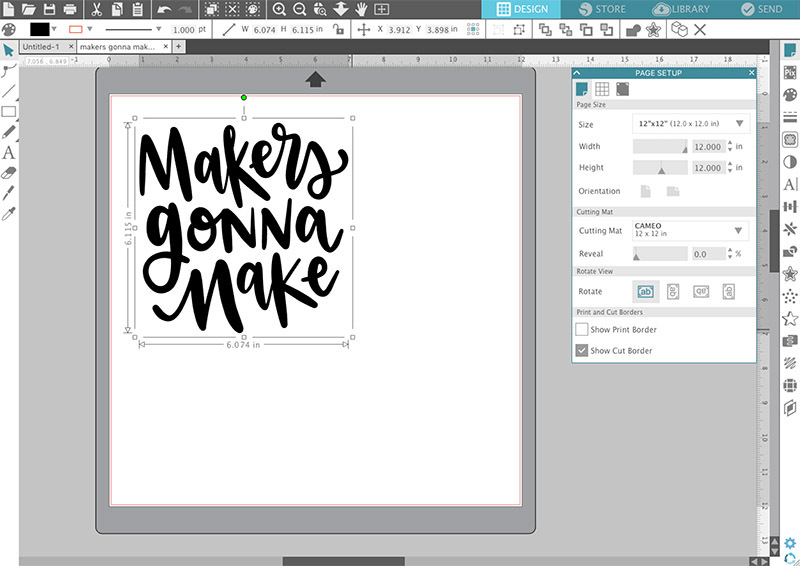 I am using my “Makers Gonna Make” design that you can get over in my So Fontsy shop. If you are looking for cut files, then be sure to check out the free cut files I have here on the blog. I also have a cut file shop and participate in a monthly cut file bundle that you may want to check out. Finally, I am also regularly pinning awesome cut files to my Silhouette board here. 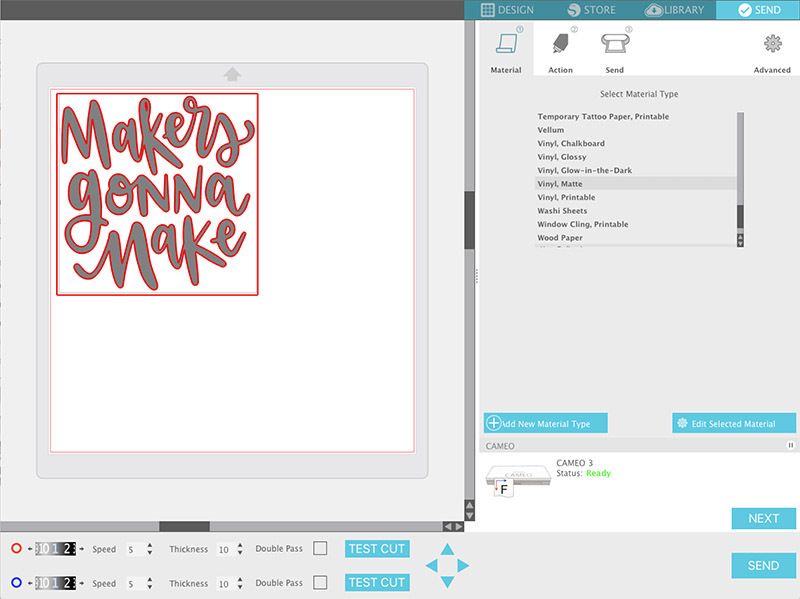 For this example, I am using my Makers Gonna Make cut file design, which is available in my shop. I will usually just grab a ruler or tape measure to determine how big I want my decal to be. I decided I wanted it to be about 6 inches wide. Open up your cut file design in your cutting machine software, and then scale the design to the size you want. I am using Silhouette Studio software, but the process should be similar with any program you are using. Simply click on the design and then drag the corner handle to scale the design to the size you want. Now we are ready to load our vinyl into the cutting machine. Finally, you will need to adjust the cut settings in your software or on your machine to work with the material you are using. This process will be a little bit different for every cutting machine, but just make sure to choose the settings for the particular type of vinyl you are using (glitter vinyl may require different settings than regular glossy vinyl, for instance). Working with my Silhouette, I selected Vinyl, Matte from the Materials menu. I recommend doing a small test cut, especially when you are working with a new material to make sure the cut settings will work well with the material you are using before attempting to cut the entire design. You want the blade to cut through the vinyl cleanly without cutting through the backing. This is called a “kiss cut,” and it will make it much easier to weed and apply your decal in the next steps. If your test cut has gone through the paper backing, you may need to decrease your thickness/depth or blade setting, or if the test cut didn’t go all the way through the vinyl, you may need to increase the thickness/depth or blade setting. 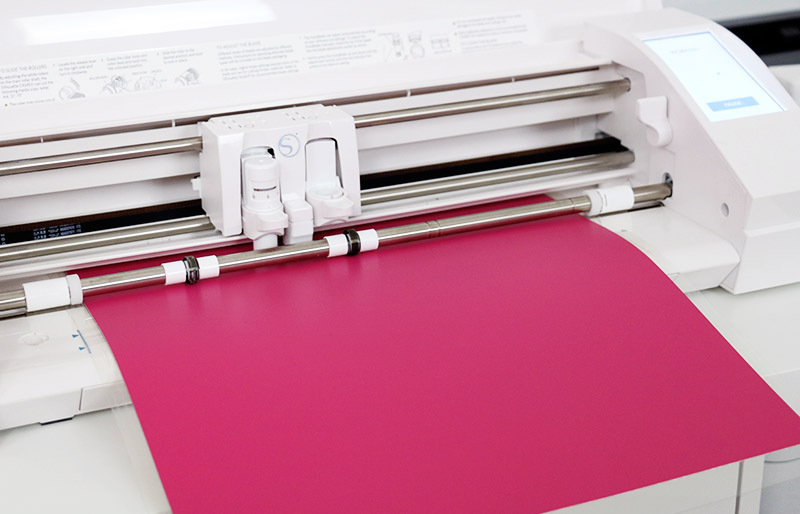 When you are happy with your cut settings, load your cutting mat with the vinyl paper backing down into your machine, and cut! If you have any difficulty seeing your cut lines, you can try gently bending your vinyl or holding it up to a light or window. 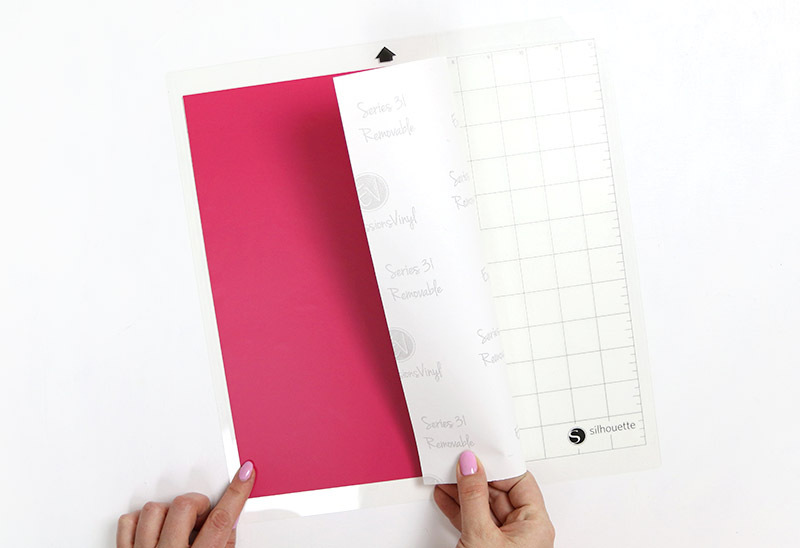 The Cricut Bright Pad is another option. 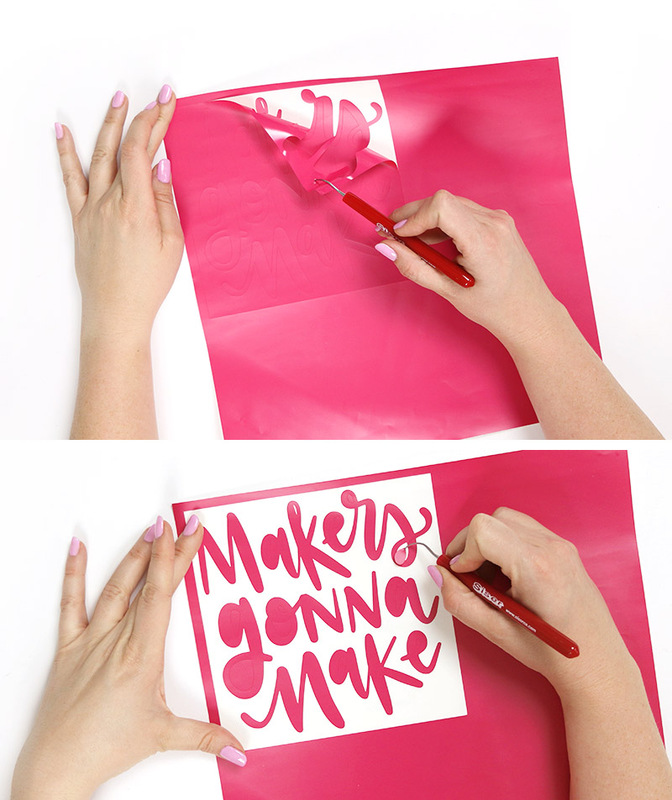 Once you find your cut lines, use your hook or other weeding tool to gently lift up the edge of the negative space and pull it up off of the paper backing. I like to start by removing the vinyl from around my design first and then remove the pieces from inside letters and other parts of the design. 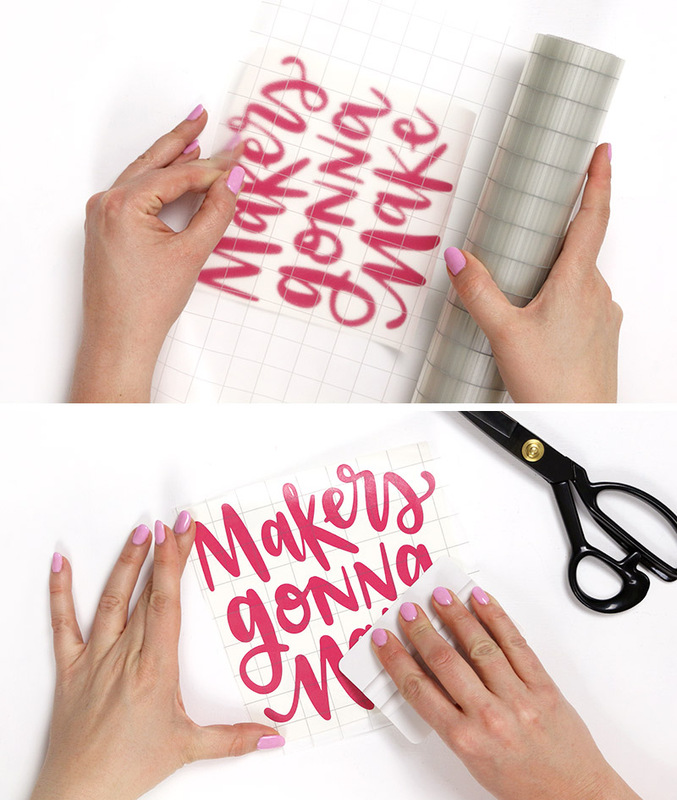 Guys – a good transfer tape is your secret weapon in becoming a DIY vinyl decal master. There are lots of different brands and types of transfer tape available, but I really like using and highly recommend one of the clear transfer tapes from Expressions Vinyl. One of the rolls will last you forever. If you get it, I do not think you will regret that purchase. Whatever transfer tape you use, start by cutting off a piece about the size of your decal, and smoothing it on to the top of your decal. Use an application tool, scraper tool, or even an old credit card to smooth the transfer tape onto the decal. Next, slowly peel the transfer tape and the vinyl decal up off of the paper backing. Then, carefully position your decal over your surface. Gently place one end down on the surface and smooth it out with your fingers. Then use your application or scraper tool to burnish the decal onto your surface. Remember, the vinyl’s adhesive is activated through pressure, so give it a good rub to get it to stick well. Finally, peel off your transfer tape, and you are all done! Your awesome DIY vinyl decal is applied! Learn how to make multi-colored vinyl decals easily with registration marks. Learn how to use the hinge method for precise application and smooth application on curved surfaces. Learn how to make colorful and detailed vinyl stickers with printable adhesive vinyl. If you would like to branch out into the world of heat transfer vinyl and make your own custom t-shirts, tote bags, and more, be sure to check out my beginner’s guide on using heat transfer vinyl right here. You are welcome! 🙂 Thanks for stopping by and leaving me a comment. Hi, thanks for this, I am a total beginner! If I attach transfer tape, the side facing up will then be sticky, correct? What if I want to save it for later, or give it to a friend, what can I cover the sticky side with that will not damage it and will be peelable later, both for regular adhesive vinyl and permanent outdoor vinyl? When you apply transfer tape, you put the sticky side of the transfer tape down on top of the decal to help pick it up from the paper backing. The sticky side of the transfer tape should be facing down towards the decal. The top of the transfer tape is not sticky. If you want to get a decal to a friend to apply, I would apply the transfer tape on top of the decal and just leave the paper backing in place. Explain that to apply the decal, they will peel off the paper backing, apply the decal to the surface, and then peel off the transfer tape. I hope that makes sense! Let me know if you still have questions. Thank you, I think I understand! So, for example, it will be Transfer tape, middle layer of decal (color, non-sticky side facing transfer tape) and then the paper backing from the vinyl. Is it possible that the cut didn’t go all the way through? If the excess vinyl is still connected in places to your design, it may start to pull up too. So I would recommend adjusting your cut settings and see if that helps. Other than that, my only other tip would be to just go slowly when peeling the vinyl off. My girlfriend is beginning to get into this stuff and I want to help her out. What hardware and materials are good for beginners? I’m looking to buy her a printer but want to make sure I get the right one. She wants to do a lot of lettering so whatever you recommend for that would be great. Thanks so much for your advice. Great column btw! Hi Mickey! I am a Silhouette user personally, but I have lots of friends who love their Cricuts. If she will mostly be cutting vinyl and paper, then I would recommend either the Silhouette Cameo 3 or the Cricut Explore 2. I personally believe the Silhouette software is far superior, which is one reason that I love it. Some people argue that Cricut has an edge in cutting ability, but I don’t have personal experience with that, so I can’t really comment. If she is interested in cutting fabric, maybe check out the Cricut Maker (it is more expensive though). Hope that helps! I just started using my Cricut to make vinyl decals. My problem is that the paper backing of the vinyl sticks to the mat and doesn’t come off. I’ve tried the lightest duty mat and still managed to ruin the mat. What the heck am I doing wrong? Can I just put the vinyl in without a mat? I have a Cricut Explorer.